"It is an interesting and demonstrable fact that all children are atheists, and were religion not inculcated into their minds, they would remain so." It seems to me that there must be many things children would demonstrably be if left to their own devices. They would go to bed with their parents and sleep with them in their own beds if they weren't shunted off to their own rooms at 7pm. They would not troop off to school at 8am every morning if we did not force them to. I'm sure they would rarely bathe, and hardly ever change their undergarments, if they even chose to wear any at all. In fact, they would probably prefer to go naked. It is the disapproving adult gaze, the "tsk, tsk" and the shake of the head, that forces them in to constraining clothes. It would be pyjamas all day every day in our house. Ernestine Rose starts by claiming that all children are atheists, and then takes a left turn by saying that they would remain atheists "were religion not inculcated into their minds". This makes religion, and not God per se, the source of the problem. It also makes religion the opposite of atheism. Religion has little to do with God, but a lot to do with power and subjugation and fear. It is religion that is the man-made structure. Man has a great need to come together, to commune and congregate. God is as good a reason as any, and so, by all accounts, is atheism. Just look at the Out Campaign website for some evidence. 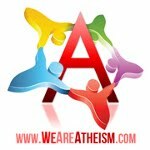 Indeed, it could be claimed that atheism itself is a form of religion. It has its own entry on the BBC's Religion section. Some get annoyed at the claim that evolution is a "belief", but even if we accept as fact that life evolved, there are still a variety of denominations of evolution to choose from. The clergy/laity divide is noticed when we ask a lay person what branch of evolution they favour. The majority don't really know - all that technical stuff is left to the scientific "clergy". It even has a set of laws - the scientific method. If these are not abided by, ones views are not accepted, they won't even be admitted and challenged. Of course, there would be no need for atheism if there was no religion. Atheism rose up as a rebellion against religion. People who were fed up with being looked down upon by the believers eventually revolted and found themselves in a position where they, in turn, could look down upon the believers. They could claim intellect and intelligence, and that the God mob were ignorant and stupid. It is a rebellion against the claim of Psalm 53:1 that, "The senseless one has said, 'There is no God.'" It is playground fighting: "You're stupid!" "No, you're stupid!" It is Revenge of the Nerds writ large. Then atheism wheels out the heavyweight comedians to point and laugh at the imbecilic "believer". They lament having religion "forced down the throats of our children", and in return adopt their own form of bullying. The problem is, once we become dogmatic, stake out a claim, write a credo, we have given up our freedom. We become shackled to the dogma - chained and enslaved. We are no longer "free thinkers" because we have closed the door to a particular area of thought, and locked it up. Perhaps the psalmist needs to be given a little credit for discerning that "the senseless one has said 'There is no God.'" To adopt an unmovable position is to close yourself off from any other possibility, whatever that might be. Left to their own devices children would neither believe in God nor not believe in God. They would have no thought either way. They would, however, be inquisitive. Eventually the question, "How did I get here?" arises. At a very early age children can begin to question the probability of their existence. "All children are atheists," fails to accept that at some point - way-back-whenever - some "child" did begin to wonder about life. In the absence of any other answer the "child" understood life and everything else to be the work of a higher being. Laughing at "creationism" amounts to the same comedy mileage as guffawing at the notion of a flat earth, or turtles all the way down. How do we think the idea of God arose in the first place? Hidden away in the recesses of man's mind is the realisation that there exists something bigger than themselves. They are humbled in the face of awesomeness - the mighty ocean, the blazing sun, the confounding night sky. They recognise the fragility of their own lives, and in the absence of anything better they came to the conclusion that there must be a greater being. And all of this just on our tiny planet. Figuring out the answers to life and existence is like being handed a blank piece of paper and being told to completely cover it in pencil. How much of the paper do we think we have covered? Nobody knows. Nobody would be so foolish as to hazard a guess. Man scores with the pencil, and then finds he has to rub it out and score again because what he once thought he does not think any more. So, man once thought that God fashioned each individual animal. Just because it is written in the Bible doesn't make it an unchangeable fact, it just means that is what people once understood. We do not obliterate God the more we understand about life. God is the paper it is written on. Neither side realises that God doesn't mind if he remains unrecognised or unacknowledged. His is the ultimate example of giving and "not letting your left hand know what your right is doing." Love and the free gift of grace does not expect anything in return, not even a thank you. It doesn't even demand that you enjoy the gift, because God remains unaltered by man's attitude and action. Life is just so much better when lived in love and appreciation. Ernestine Rose's drive seems to have arisen as a reaction against the way she was treated by her religiously dogmatic father. Her life appears to be a catalogue of mistreatment. It seems highly unlikely that she ever analysed her own situation, but was simply motivated by her experiences. It seems ironic that after spending a lifetime speaking out on behalf of women's rights, criticising religion, and demanding the abolition of slavery, Ernestine Rose still remained an advocate of a different form of slavery when she promoted atheism. Only once we have made the journey into self-discovery do we realise that the whole debate is an entirely unnecessary one.